An employee rotates wheels of aging Gouda at Holland’s Family Cheese in Thorp. It took just seven short years for Marieke Penterman to go from being a novice cheesemaker to making the best cheese in the United States. Next up: Making the best cheese in the world. It’s not an unrealistic possibility for the Thorp cheesemaker, who was winning awards for her Gouda within a few months of beginning to make the authentic Dutch specialty. In the meantime, Marieke – whose product bears her first name – is happy to defeat her homeland’s cheese elite at their own game. “This year we had the World Cheese Championship, and all I wanted to do was beat the Dutch,” she said with a smile during a recent open house at her family’s new dairy, cheese factory, and store on Thorp’s south side. 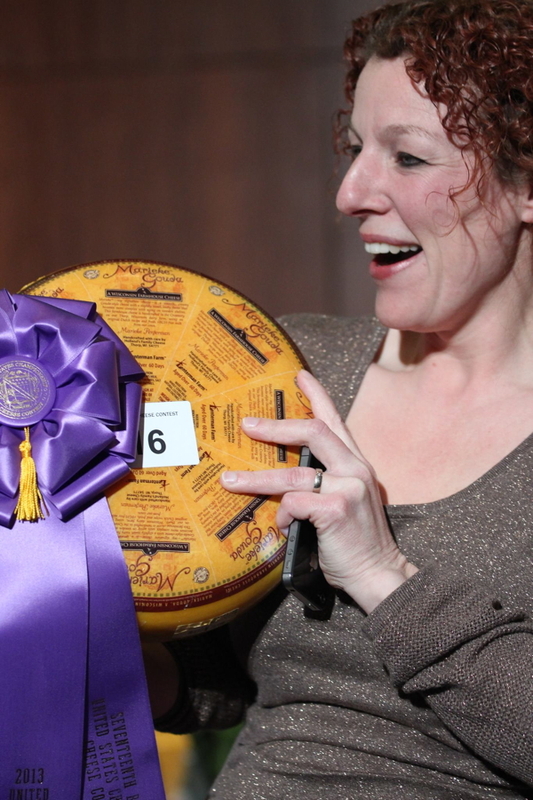 She and the Holland’s Family Cheese team succeeded: Their Marieke Gouda Super (which is aged 18-24 months) came in fifth among all cheeses at the world contest in Madison last March. Furthermore, Holland’s Family Cheese varieties swept the first, second, and third spots in the contest’s aged Gouda category. Considering Gouda cheese takes its name from the city in Holland where it was first sold, that’s an achievement akin to an American winery beating out the best bubbly produced in Champagne, France. And for cheese connoisseurs, Marieke Gouda is akin to a fine wine. The U.S. champion variety – Marieke Mature Gouda, which is aged six to nine months – is creamy, nutty, and caramelly. In your mouth, it almost feels like chocolate. Marieke Gouda is available in seven different ages (from two months to two years old) and 14 flavors (including black pepper, smoked, honey clover, and burning mélange – which, despite its name, is sweet, not spicy, and flavored with nettles). U.S. Cheese Championship in Green Bay. From the beginning, Marieke had ambitions beyond dairying alone – “I thought I had to do something before I turned 30,” she says – and eventually her appetite for a taste of home led to her professional calling. Visitors from Holland brought her authentic Gouda from back home, but her supply always dwindled. As she lay awake one night, she found a solution: She would become a cheesemaker. Marieke pursued a state license – which entailed taking classes and pursuing an apprenticeship – and after two trips to Holland to study authentic techniques, Marieke was ready to get the cheese wheels rolling. It didn’t take long for her creamy creations to gain notoriety. In 2006, she produced her first batches of Gouda. Within four months, her Foenegreek-flavored cheese won an award. It was the first and only award given to Marieke alone; all subsequent awards have been received by the Holland’s Family Cheese team. “I never knew how much work cheesemaking was,” Marieke says, explaining why she shares the credit. On a recent Saturday, hundreds of visitors wandered the grounds during an open house, sampling (and buying) cheese, and exploring the barn and factory. In the barn, cows are milked in a space-age automated milking parlor. Between milkings, the Holsteins (and a few Brown Swiss) lounge in sand in the open-sided, “free stall” barn (in other words, Bessie can wander about as she wishes instead of being restrained in a stanchion). The milk is piped directly from the milking parlor to the creamery; visitors to the parlor’s observation deck are invited to touch a pipe to feel the heat radiating from the milk. If there’s a secret to her success, Marieke says this is it: Instead of relying on milk from multiple sources that may be several days old and may have changed temperature numerous times, the Pentermans use milk straight from their own cows and convert it to cheese in just five hours. Once inside the creamery’s vast, stainless steel tanks, cultures and rennet are added to the milk to create curds, which are washed, pressed, drained, cut into blocks, and finally pressed into wheels. The identical white wheels are soaked in brine for 60 hours, then moved to the aging room, where they are painted with a substance that protects the cheese but allows it to “breath” out moisture. In the aging room, thousands of 20-lb. wheels of cheese age on imported Dutch pine planks. It’s a centuries-old process, but the barcodes attached to each wheel of cheese are a nod to 21st-century quality control. For the first two weeks, the wheels are rotated by hand daily to ensure an even distribution of butterfat. After that, they are rotated twice weekly. 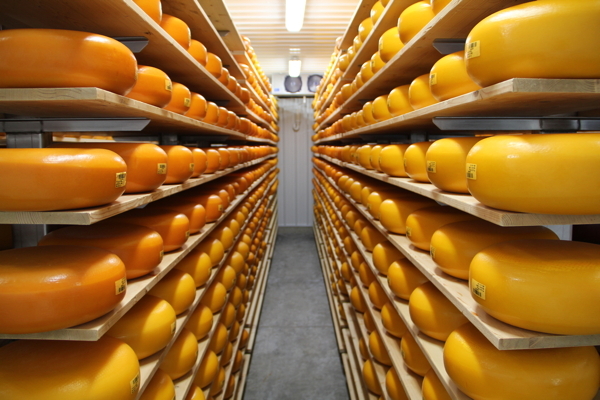 The wheels of cheese and the planks themselves are also cleaned frequently to prevent mold. The cheesemaking can be observed from the store, which, in addition to all the family’s Gouda varieties, carries a range of regional cheeses – including LaGrander’s from Stanley, Lynn Dairy from Granton, and Gingerbread Jersey from Augusta – as well as local wines, a number of imported Dutch goodies, and more. Like the barn and factory, the gift shop is new, but already the walls are half-filled with awards. It’s easy to imagine that the Pentermans will eventually need an addition just for the ribbons, plaques, and trophies they collect. The family’s competitive success is a testament to Marieke’s “skill and passion in cheesemaking,” says Carpenter, of Wisconsin Cheese Originals, while the success of the business is also a testament to the family’s openness. “The Pentermans have built their new facility in a way that welcomes and invites visitors to see how a working farm and cheese factory operates,” she says. “The fact that the Pentermans are adding value to their operation by making cheese right on the farm is a win-win for Wisconsin: We get to eat great cheese that adds to our local economy,” Carpenter adds.